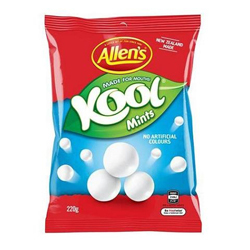 Refreshingly round mints that are made especially for your mouth and 97% fat free. Cane Sugar, Glucose Syrup (From Corn), Maltodextrin (from Corn or Tapioca), Palm Oil, Stabiliser (Hydroxypropyl Starch), Flavours, Colour (Titanium Dioxide), Glazing Agent (Carnuaba Wax), Egg White, Emulsifier (Soy Lecithin). Great in the car in order to keep the mouth moist, taste great too. Bought some on a visit to Australia and try to keep them in our glove box. Great!!! !